Marc Hoffmann began his professional career in 1984 with Morgan Guaranty Trust Company, where for nearly three years he divided his time between New York and Brussels, before serving as Vice- President of JP Morgan Securities London from 1987 to 1990. From 1990 to 1995, he worked for the AIG Group (UK), initially as Vice-President and head of Financial Products Marketing for Europe, then at Banque AIG in Paris, he became Chairman of the Management Committee. In 1995, Marc Hoffmann returned to his native country, joining Dexia-BIL in Luxembourg, first as consultant to the Management Committee and as head of Financial Markets. He became a member of the Management Board in 1996 and ran the private banking, financial banking, institutional banking and fund administration activities. 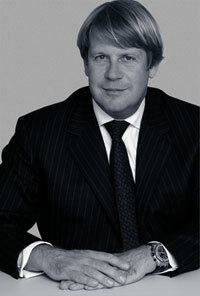 Appointed Chairman of the Management Committee in 2001, he also became a member of the Dexia Group Executive Committee. In 2006, he founded the Compagnie de Banque Privée (CBP), specialized in private banking services. In 2011, CBP and the Quilvest Group have merged their Wealth Management activities to create Quilvest Wealth Management (QWM). Since then CBP changed its name to Compagnie de Banque Privée Quilvest (CBP Quilvest). Nowadays Marc Hoffmann is the C.E.O. of both companies (CBP Quilvest S.A. and Quilvest Wealth Management).